Belgium's rich cultural legacy is embodied by its collection of one dozen UNESCO World Heritage Sites. 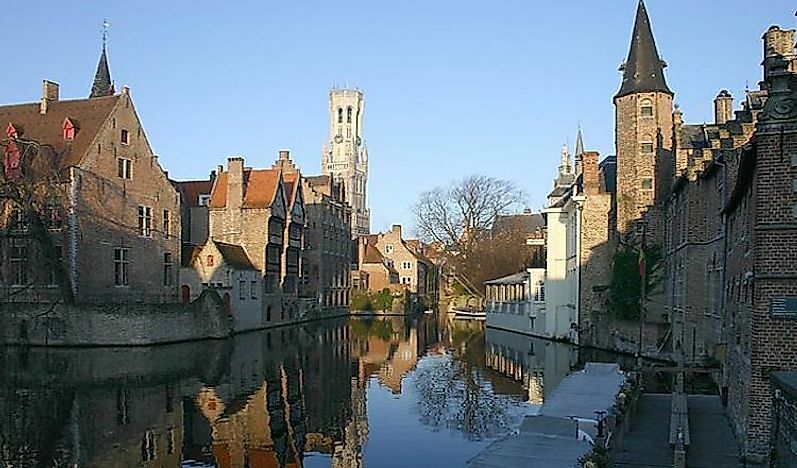 The Historic center of Brugge was inscribed in 2000 by UNESCO as World Heritage Site. Belgium’s rich cultural legacy is embodied by its collection of twelve UNESCO World Heritage Sites in different parts of the country listed between 1999 and 2016. Seventeen other sites are on the tentative list. Since joining UNESCO in 1946, Belgium has endeavored to preserve its cultural sites scattered across the country. These cultural sites have played a significant role in placing Belgium as a major tourist destination in Europe. This site was listed by UNESCO as a World Heritage Site in 1999. Belfries were a common feature in Medieval Northwestern Europe, mainly in Belgium, Southern Netherlands, and France. The buildings attest to the prosperity, independence, and affluence of a particular city. Belfries were used for city council’s settings, like prisons, as watch towers, and as havens for the city’s treasures. They were built between the 11th and the 17th century, under different architectural influences such as Gothic, Roman, Baroque, and Renaissance. They represented a victory in gaining civil liberties. Belgium has 33 of the 56 belfries present in both Belgium and France. They tower in modern day Belgium, representing the middle-age birth of municipal power in place of feudal power. They also serve to preserve the culture and represent Europe’s architecture. These towers include those found in Bruges, Mons, Antwerp, Menen, and Ghent. The belfries in Belgium are top tourist destinations in the country. The Flemish Bѐguinages were inscribed in 1998 as heritage sites by UNESCO. They are a cluster of lay convents that began to mushroom with the religious revival in Western Europe, at the start of the 13th century. They were home to the Bѐguines, who were religious women who opted for a different way of religious lives than those led by nuns. They built Bѐguinages as enclosed communities, and spent most of their time caring for the sick, working manually and engaging in prayers. They were smaller towns, complete with houses, green areas, churches, courtyards and ancillary buildings. They blended urban and rural architecture, and the result was impressive buildings. Most of them felt into disrepair during Belgium’s annexation by France, but those that remain are symbols of cultural heritage and are home to few numbers of Bѐguines. The majority of the remaining Bѐguinages are found in Flanders. Any potential activity on the buildings has to be approved by the regional monuments and sites administration. The sites are owned by different parties, and this has hindered an inclusive management plan for all of them. The Historic center of Brugge was inscribed in 2000 by UNESCO as World Heritage Site. The center has been ranked as one of Belgium’s most popular destination. It is a settlement that represents different architectural styles that have swept through Europe in different centuries. This old city has ancient buildings, churches, and museums lined on cobbled streets and canals. Brugge has evolved over the years to become a modern cultural and commercial center in Europe. The city is a blend of both medieval and contemporary influences and is characterized notably by its ancient Gothic structures. The city’s cultural heritage is closely monitored by the Department of Conservation and Heritage Management, which ensures that urban planning does interfere with the historical fabric of the city. This cultural site was listed as a World Heritage Site in 1998 by UNESCO. The site was built in the 13th century as a merchant market. The square is one of the most majestic squares in the world, reflecting both Gothic and Baroque architectural influences. The square has evolved into an urban site, complete with restaurants and cafѐs against a background of medieval guildhalls and a town hall. The square gives a glimpse of the cultural and social life as it was in medieval Belgium. The square is also home to the National Brewers’ Museum and is undoubtedly a significant player in Belgium’s tourism sector. Other UNESCO World Heritage Sites in Belgium and the year they were listed include Mining Sites of Wallonia (2012), Brussels Town Houses of the Architect Victor Horta (2000), Neolithic Flint Mines at Spiennes (Mons ) (2000), Notre Dame Cathedral of Tournai (2000), Plantin-Moretus House, Workshops and Museum Complex (2005), Stoclet House (2009), Four Lifts on the Canal du Centre and their Environs, La Louviѐre and Le Roeulx (Hainaut) (1998), and Architectural Work of Le Corbusier (Charles-Edouard Jeanneret -Gris) at Maison Guiette (Les Peupliers) in Antwerp (2016). Besides, the 12 listed sites, there are other 17 sites on the tentative list and can be approved any time.